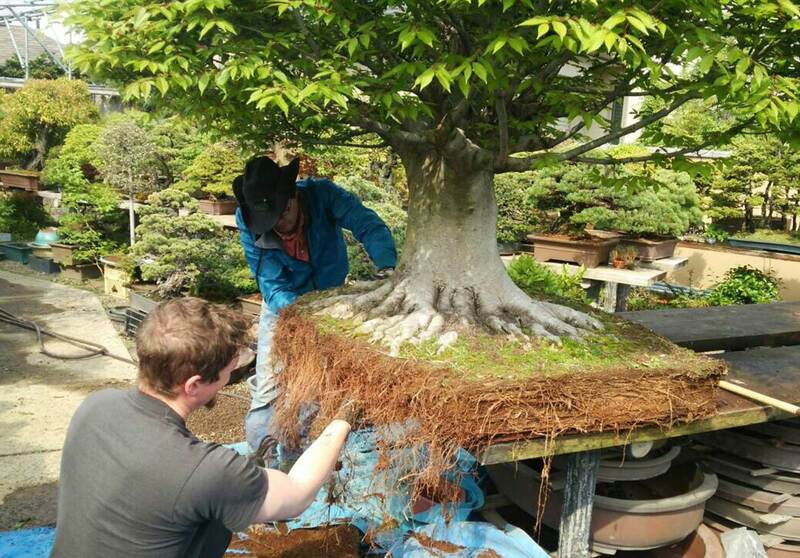 (GV) Adam, we met when I was visiting the bonsai nurseries at Omiya, the famous bonsai village of Japan. I was surprised to see a non-Japanese person working alongside locals, in such a specialized and old-school environment. Undoubtedly, Japan can be quite conservative sometimes, and I think bonsai culture is one of those cases. 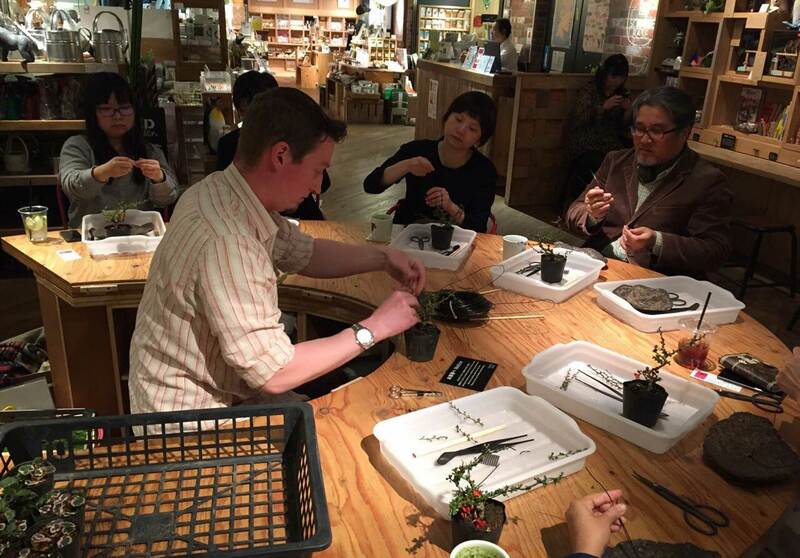 How did you first approach the world of Japanese bonsai and find out about this opportunity? (AJ) I think like most Americans my age, I first encountered bonsai in the movie “The Karate Kid” when I was a very young child, so I have been aware of bonsai, or at least a basic idea that something called bonsai exists for most of my life. But what brought me to Japan initially was a desire to experience how the Japanese culture interacts with nature. Things like Japanese garden design, and Shinto. I was living nearby for a different job and on my weekends I would come to the bonsai village, and walk around to enjoy all the trees. Actually before moving here I had never even heard of the bonsai village, but at that time a co-worker suggested I should visit the bonsai museum. One day I found myself at Mansei-en, and decided then and there: “Yes, I will learn how to do this. 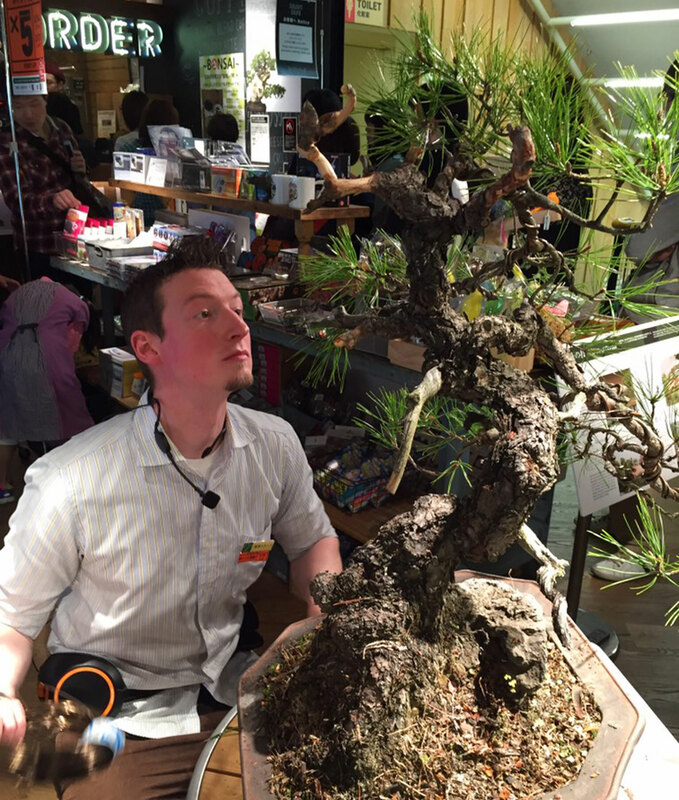 I will become a bonsai master.” From that point on whenever I could I would go to Mansei-en to look at bonsai, and eventually I built up the nerve and asked how I could learn. They were very willing to help and said maybe I could study there. Then I started coming on my weekends to help out and do simple tasks like weeding to see if I enjoyed the job. Really the depth of information and history in the Japanese bonsai community may make it seem closed off to outsiders, but I think actually the people involved are very welcoming. Mansei-en, the nursery where you are working, has a fantastic reputation in Omiya and the whole of Japan. The father of the current owner was one of the most influential bonsai masters of his time. How did the history start here? Mansei-en is actually older than the bonsai village. 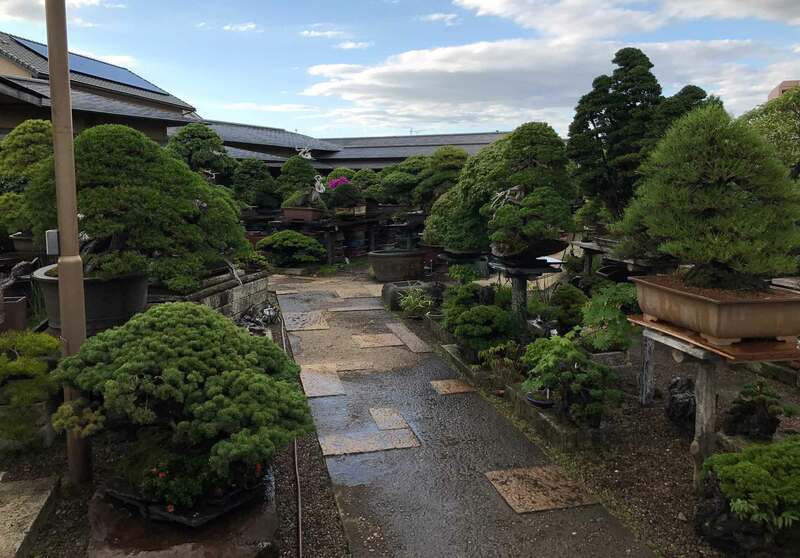 Originally it was located in Tokyo, but after a very large earthquake and fire in 1923 many bonsai gardens joined together and created the Omiya bonsai village. Have they been running their traineeship for a long time? Is it a competitive (e.g. language requirements, application and interview process)? 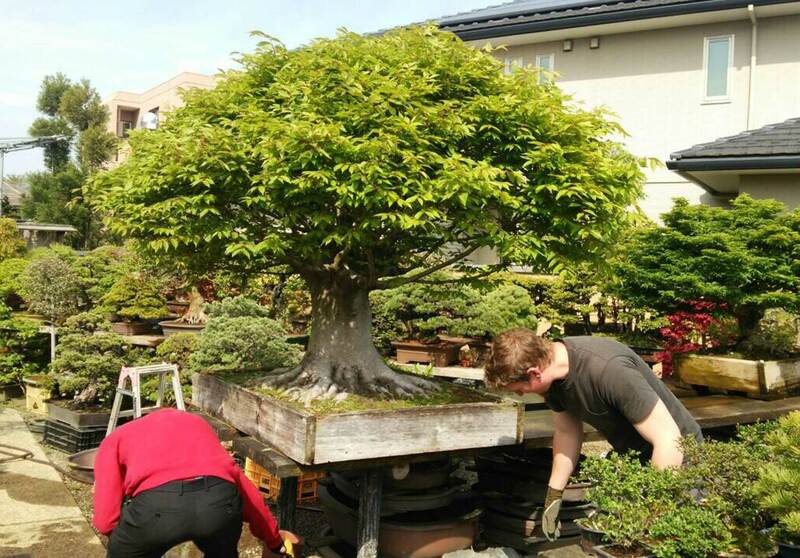 Mansei-en has had many apprentices over its long history and today many well-know and influential bonsai professionals in Japan studied at Mansei-en. 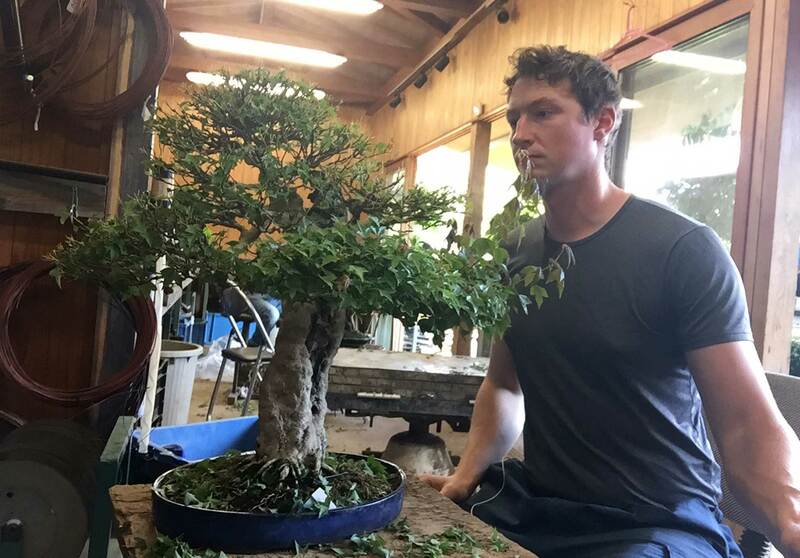 Being accepted as an apprentice really depends on the individual, there is no set application process, but in general you have to be willing to commit to five years of studying, and show an earnest desire to pursue bonsai. With regards to foreigners, you really do need to know speak and read Japanese to study here. There are so many subtle intricacies in bonsai that if you can’t understand what people are saying or can’t read descriptions in books you are going to miss out a great deal of information. How would you describe a standard working day at the nursery? On a typical day we start at 8:00 with general cleaning chores, after that we go about whatever the day’s job is, and we usually finish between 6:00 and 6:30 pm. Many days however are not so easy. It is not uncommon to work from 6 am until 10 pm during a busy time of the year. 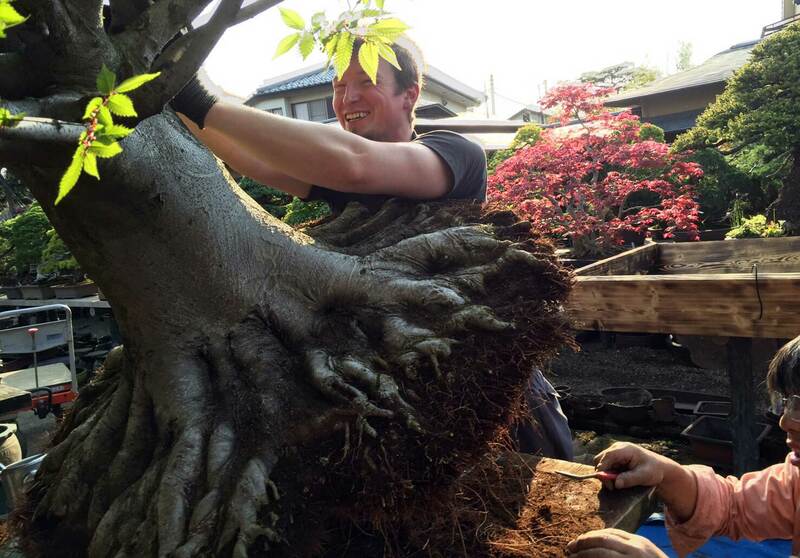 As an apprentice we learn by doing, so over the years and throughout the seasons we learn to do every kind of job needed with every kind of tree we have. Of course to start with you do a lot of cleaning and picking weeds. As a trainee, do you focus on some specific jobs or plants? 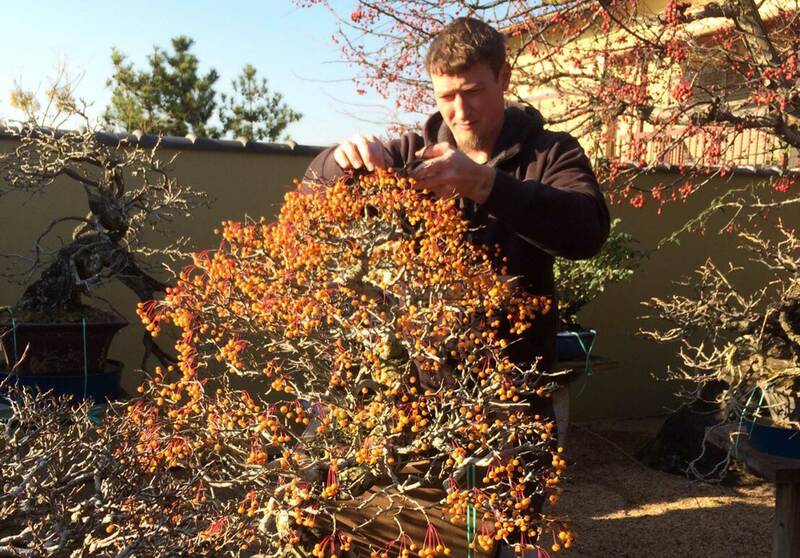 Much of the work we do with bonsai is dependent on the seasons. Thus, for example we repot in early spring and de-candle pines in early summer. While older apprentices and skilled workers focus on important trees, or clients trees, for younger apprentices there are always cheaper trees that need the same seasonal work done as expensive trees to practice with. Have you been given work with important or expensive plants? When I first started I was quite nervous to work on high quality trees or trees already owned by clients, but as the years have gone on my comfort with important trees has increased along with my skill level. The United States are the country were Japanese bonsai were first exported and understood. Since their introduction, they are becoming more and more popular. American enthusiasts are by far the largest foreign representative I have seen during the Saitama Convention. In your opinion, how is the trend going in the USA and the West compared to Japan? I’ve heard that bonsai culture is declining in Japan. Do you think is it true? Are the new generations still taking an interest in bonsai? Talking about the differences between Japanese and American bonsai could be a whole interview in itself, but I’ll try to draw some broad generalizations. Firstly I think bonsai is probably more popular outside of Japan than it is within, so there seems to be a raising excitement in America and throughout the West. America is an extremely large land mass with many different climate types which present a huge variety of American tree species to work with. There also happens to be many mountains which provide a great source of raw material, what we call yamadori (translatable: “collecting plants from the mountains”). I expect to see American bonsai really mature into world class bonsai in the near future. That’s very interesting. Allow me to indulge on this point and ask you some of the differences in bonsai culture between USA and the West compared to Japan (in terms of industry, aesthetics, plants used). I think that almost anywhere you go around the world bonsai aesthetics draw from those established by the Japanese. Ideas like basic proportion, balance or harmony with the pot inevitably are similar everywhere to those ideas here in Japan. However, each country has its own unique cultural history, and it’s within that cultural context that the deeper meaning of aesthetic choices is found. So for example, if a Japanese looks at a pine tree the sense of nostalgia and meaning they feel is based on their knowledge of Japanese culture, for example the idea of wabi-sabi or that pine trees represent long life. But if an American looks at an American species of pine, that sense of nostalgia will be different. The feeling of the tree exists in a different cultural context, where they don’t represent long life. 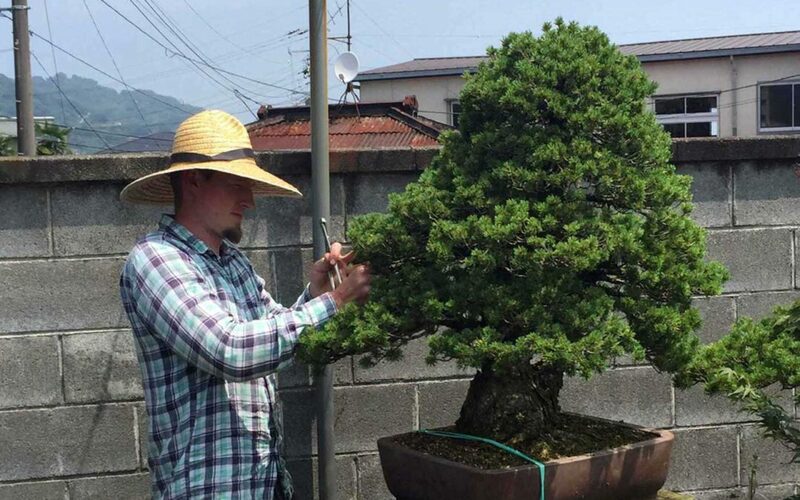 I think in Japan they have a long history of bonsai with well-defined meanings and allusions, but in other countries with much younger bonsai cultures that deeper bonsai aesthetic is still forming. What about a country with a strong and well-defined aesthetic history – say, Italy? If we look at Italy for a moment, I think everything I just said about America holds true with one major advantage to Italians, that being the rich Italian art history and culture. In fact Italian bonsai is highly regarded for its quality and style, and I’m sure that in part has to do with the influence of art history. I sometimes think that, in order to become a gardener in Japan, one doesn’t necessarily need to gain a technical horticultural education as such. 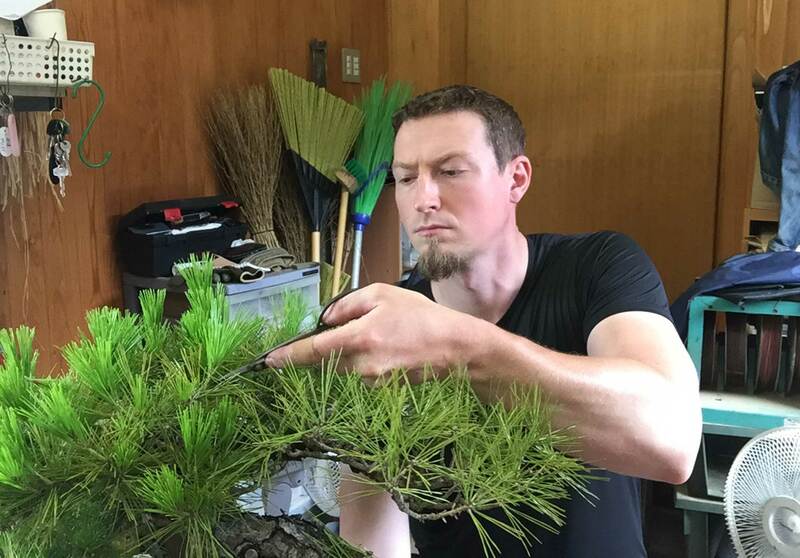 Jake Hobson, the author of Niwaki (an inspiring book on Japanese-style pruning), was trained as a sculptor before working in Japanese gardens. In his book he wrote that his artistic background, free of horticultural technical preconceptions, allowed him to better understand the world of Japanese gardening. As a bonsai grower, what is your opinion about this view? I came to bonsai after I finished a degree in the fine arts, my focus was on painting and printmaking, so I think there is something to this idea. Bonsai is very much the combination of horticultural knowledge and art aesthetics. Surely one must have a solid horticultural foundation to work at the highest level of bonsai, otherwise the trees health will suffer, but the artistic design choices being made are in fact that, artistic. The bonsai which I am pulled towards, or the ones which really resonate with me, are those that have uniqueness, a quality that is difficult to describe, but hits a cord inside my heart. This feeling is also very present when looking at paintings or sculptures from my favorite traditional artists. Are there other aspects of Japanese culture and arts that your find close or inspirational for bonsai appreciation? Bonsai is one of many traditional arts practiced in Japan and as such surely shares many common themes with things such as Japanese poetry, Buddhist thought, and so on. I strongly believe that the more you know about all of the Japanese traditional arts, the more rich your bonsai understanding will become, especially with regards to displaying bonsai. When I used to work in England, I came across a gardener who was also a genuine bonsai enthusiast. When I asked him why he loved bonsai, he said that he could get a lot of satisfaction in controlling and manipulating nature. After visiting the nurseries at Omiya though, it seems to me that the attitude is almost opposite here in Japan. The plants are recognized as living entities and their movements and desires ultimately followed. What is your opinion about these rather opposite views? The relationship between a tree and the grower could best be thought of as a dance. There is a leader and a follower, but both are equally important. For trees if we try to bend them to our will and force them to do things they don’t want to do, their health will suffer and they may ultimately die. So it is very important to work with the tree. We call it bonsai training for a reason, the same as training a dog. We have to work with the tree, offer it a better path to grow towards, coax it towards a shape or style that best highlights the natural essence of that particular tree. Even in Japan there is always that question of nature versus man made. Some people enjoy trees where the hand of the grower cannot really be seen, while others enjoy highly stylized and worked trees. For example azaleas grown as bonsai are so far removed from their natural shape that one cannot help but see the grower behind the shape. But here again one way is not better or worse than the other, merely a different approach. You mentioned azaleas. Do you have a plant you particularly love to work with? 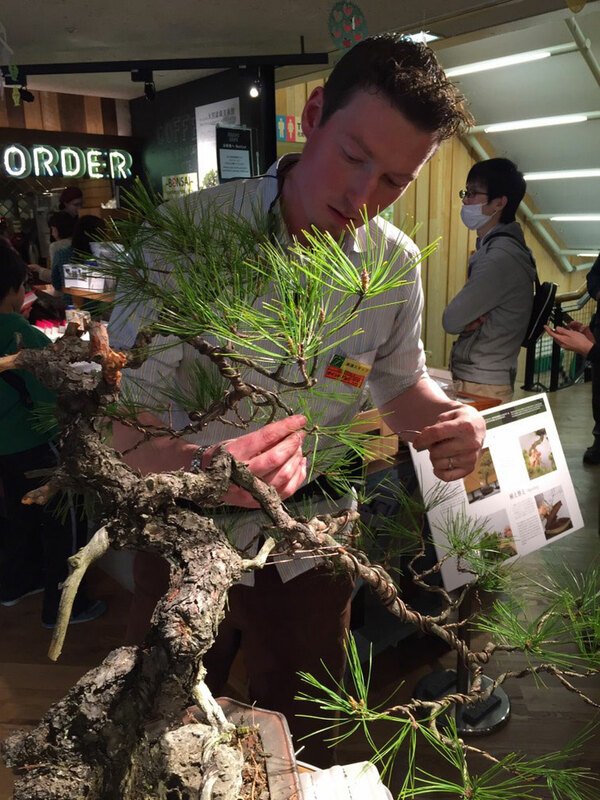 I particularly enjoy working with aka-matsu, the Japanese red pine (i.e. Pinus densiflora). They feel to me very feminine and the elegant lines which can be created are quite nice, but as a professional I was trained to work with most species with equal attention, some species like black pine (Pinus thunbergii) or members of the orange family hurt your hands and arms when you work on them, but the work still needs to be done. The art of bonsai is strongly connected with suiseki, small naturally occurring or shaped rocks which are traditionally appreciated in Japan. I’ve been looking at and inspired by these fantastic art pieces at Saitama Convention Hall. Do you work with suiseki stones? Which is your impression about this quintessentially Japanese art? My teacher is very interested in suiseki and as such I have spent a lot of time looking at great stones, but in truth I enjoy bonsai much, much more. Perhaps as time goes on my appreciation for suiseki will grow. Five years of training is a considerable amount of time. Nevertheless, when we met and chatted about bonsai culture and training, you told me that in that time one can achieve very little: perhaps, just learn the basics. I wasn’t surprise to hear that. The art of bonsai is a miniature universe, the understanding of which one can approach ad infinitum. How long do you think it takes to become a professional bonsaist? If you focus and study hard you would be able to learn the very basics of bonsai in about two years, after five you should have the ability and confidence to work with most trees in most situations, but if you become complacent and think you know enough you are missing a great opportunity. Knowledge and skills are relative. Do I know more than many – yes – but are there some who know more than me, of course. I have always been hungry for new experiences and new knowledge. I always expect new situations to offer me a chance to grow, so I suspect I will learn something new even when I am 80 years old. In consideration of what we said, do you think is it enough for a bonsaist to have experience only in “mother-land” Japan? Or are a more international training and approach required nowadays? 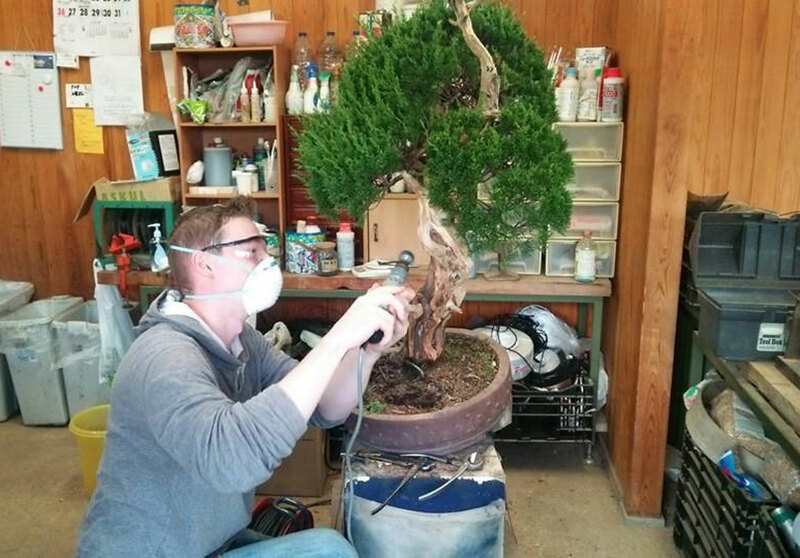 As Japanese bonsai is considered the best in the world, and most bonsai aesthetics are based on those of Japan, to be a professional a working knowledge of Japanese bonsai is pretty important, however there are a great many highly skilled bonsai artisans throughout the world. Really it is most important to know the native species and cultural history of the area where you wish to make trees. As a professional here in Japan, that means learning the Japanese way. Traveling and leaning about different trees and aesthetics around the world would be a great opportunity for me to grow. What are your plans after finishing the traineeship? Do you see yourself staying in Japan or want to go back to your homeland? After I finish my apprenticeship I will start my own bonsai nursery here in Japan, near a city called Sendai. 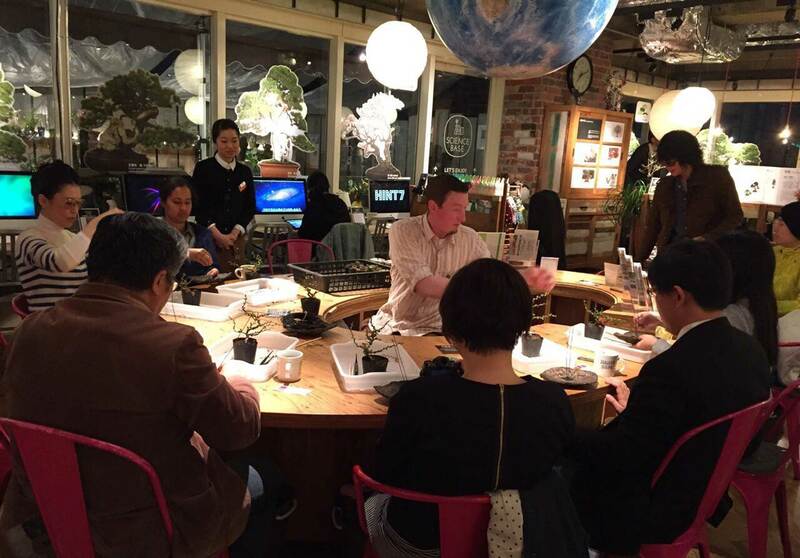 I know firsthand how difficult it is to travel here and learn, so I really hope to be a bridge into Japanese Bonsai for other non-Japanese in the future. I know that for most people committing to five years to study something in a culture and language they don’t know is very difficult. And unless you want to become a professional, for most bonsai enthusiasts it’s not really necessary. I plan to open my garden to anyone interested in spending a few weeks or a few months practicing bonsai here in Japan. I already have a quarantine facility built so depending on the details trees visitors work on may be able to be sent home with them. I think more exact details of my business plans are too much for this interview, but I am very excited about the garden I am planning. The general idea is that this thing that was so hard for me to achieve, studying here in Japan, I would really like to help others experience in the future. What do you think bonsai is ultimately teaching you, as a professional grower as well as a person? I think bonsai is teaching me patience, and attentiveness, how to appreciate the unique qualities of the seasons, how to find moments of pleasure even during mundane or burdensome tasks. But above all I think it is teaching me the connection between humans and nature.